Greenworks construction and design offers the best Los Angeles Kitchen remodeling services. We provide cost- effective kitchen remodeling in Woodland Hills and surrounding areas. When working with kitchen remodelers like us you are guaranteed a stress free process with quality work and efficient professionals. A kitchen remodel is a long-term investment and can either make or break your budget so don’t waste time or money by hiring the wrong contractor. Our goal is to provide you with a new kitchen thats holds both beauty and functionality for all your culinary needs. We believe that the kitchen is the heart and soul of a home and for some it is the most important and by far the busiest room in the house. People are constantly milling in and out of the kitchen, which makes it so important that it is both functional and attractive. No matter what the occasion you want your custom kitchen to feel open and inviting to anyone who enters your home. Whether it is a simple update or your dream kitchen makeover from the ground up, we have been providing services for kitchen remodeling in Woodland Hills and surrounding areas for over 20 Years. Investing in new appliances, a new floor, upgrading the cabinets and countertops, are just some of the things that can be done during a kitchen renovation. Whether its traditional kitchens with a timeless look or vibrant kitchens with bold designs, we do it all. 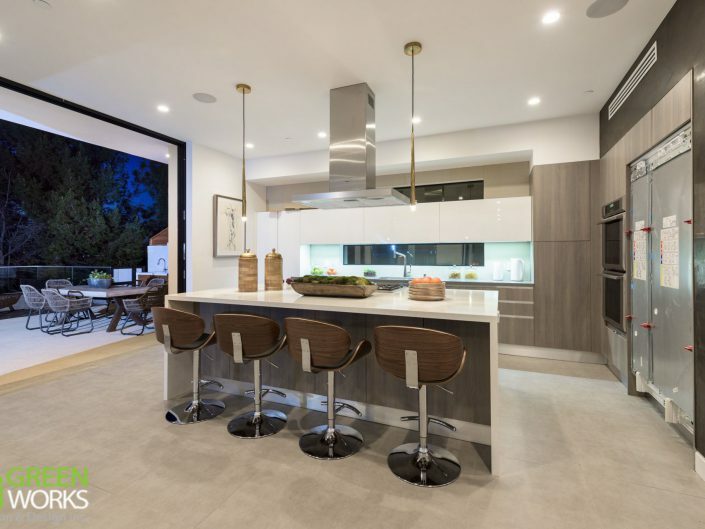 Through out the years we’ve gained a lot of experience and are able to help our customers streamline their ideas and create a Los Angeles kitchen remodeling experience that’s truly perfect for their needs. Unsure of what style you like? Feel free to browse our gallery. 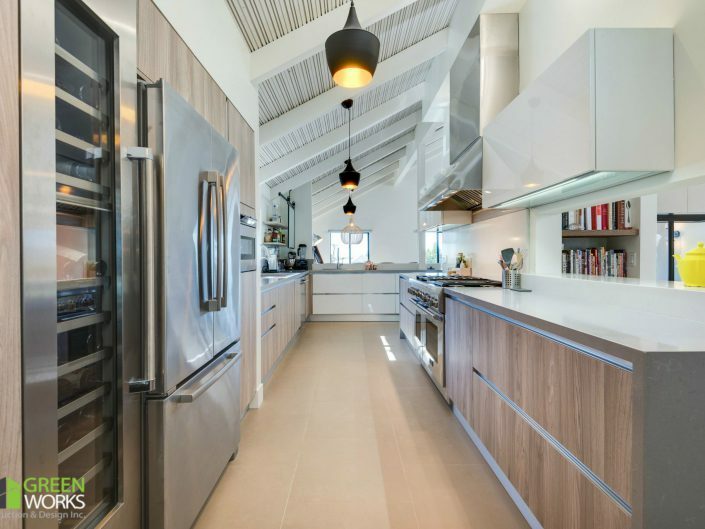 Regardless of the type of kitchen renovation you have considered undertaking, it is best to consult with a Los Angeles kitchen remodeling expert. Q. HOW LONG DOES A KITCHEN REMODEL TAKE? Typically a kitchen remodel can take anywhere from 14-30 days depending on how extensive the work is. Keep in mind that half this time is hours spent off site cutting measurements for counter materials and fabricating cabinets etc. A kitchen remodel will consist of two phases. the planning phase where we choose layout design & materials such as cabinets & countertops, propose 3-d sketch, and pull permits. Once all decisions have been finalized and material is ready to install , then we begin phase two which is the construction. By using this process we minimize the amount of time you are without a fully funtioning kitchen (In some cases Greenworks is able to provide you with a temporary kitchen).Greenworks Construction are able to beat the going average of our competition and complete a kitchen remodel in 21 days or less because we use all in-house contractors so you will never need to deal with third party delays. Structural changes can sometimes double this time because it involves getting plans approved by the city , plan check submissions, corrections and proper permitting. If your layout remains the same than we can guarantee a new kitchen in 21 days or less. Partial vs Complete: a complete kitchen gut-out will always mean a longer timeline where a partial remodel consisting of maybe just cabinet refacing , flooring and tile can be done within two weeks. Q. WHAT IS THE COST OF A KITCHEN REMODEL? Everyone’s first question is “how much will this kitchen remodel cost me?”. Well we are going to do our best to clear up any grey areas when it comes to this topic. The most important thing you need to know is that every kitchen remodeling project differs from the next. Prices vary depending on a few major things. For starters the size of kitchen is the biggest factor in price as well as the amount of cabinet and counters .Structural changes can guarantee a fluctuation in cost due to structural engineering plans and city fees. Wall removals can be costly at times if any electrical or plumbing work needs to be redone. The biggest expenses in a kitchen remodel come from the cabinets & countertops. Of course each offer a wide range of materials to choose from that can either drastically increase or decrease your budget. Tile and flooring can become big ticket items depending on your style choices. In the end what it comes down to is choice of materials and scope of work. A partial remodel can run anywhere from 6-20k where as a complete kitchen remodel can be anywhere from 25k and up. Q. QUESTIONS TO ASK WHEN REMODELING YOUR KITCHEN? First thing you should do is ask yourself what you hope to gain from this remodel. Are you improving your lifestyle, has your family grown and now your house is feeling a little too small. Are you finally treating yourself to a kitchen fit for a chef? Knowing what your expectations are before the remodeling begins can help avoid any surprises or possible miscommunication between you and your contractor. Second thing: Every homeowner wants to know “how do i get the most value for my investment?” therefore when Greenworks Construction comes out to see your project we will evaluate all the possible options based on your current layout, design choices and real estate value. Then we will give you a detailed proposal indicating a scope of work that can get you the best return for your investment. Any questions during the remodeling process can be directed to your project manager. He will be the one on site day in and day out making sure the remodel runs smoothly. He will also be accompanying you to pick materials fixtures appliances etc. 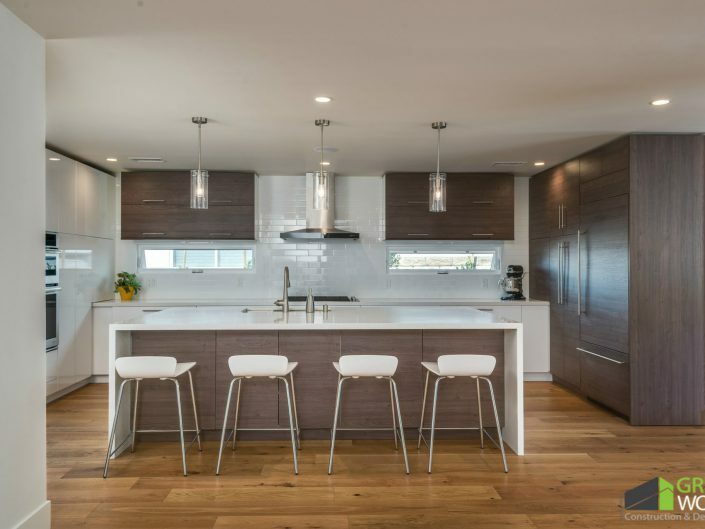 So before hiring a Los Angeles Contractor make sure to ask these questions to guarantee a smooth kitchen remodeling process. 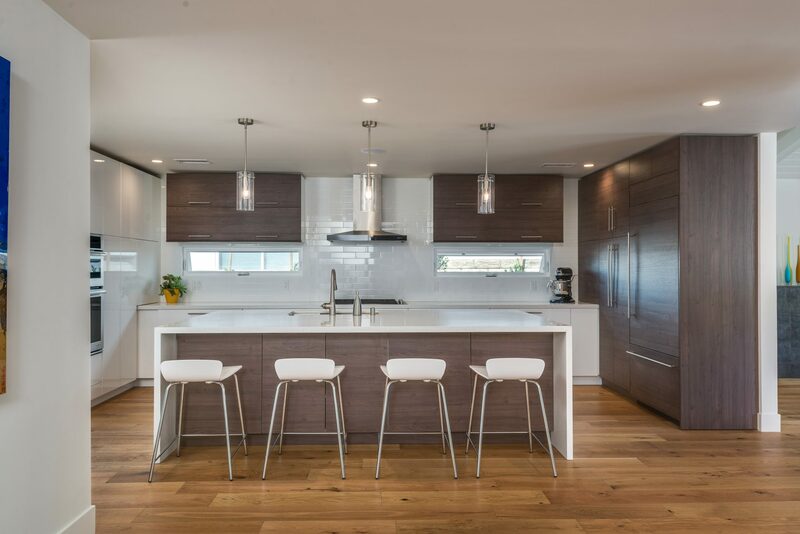 Here are a few things to know if you find yourself asking why you should remodel your kitchen. First and foremost ask yourself what are you looking to gain from a kitchen remodel? Everyone’s needs are different but we can share with you some things that might help convince you of the pros of undergoing a kitchen remodeling project. Today kitchens are the focal point of a home. That is why it’s important to find a kitchen remodel company that can properly incorporate your style and ideas into your new kitchen. Removing walls and opting for an open layout can make your kitchen inviting to anyone who enters your home. Most people remodel their kitchen to Improve their lifestyle. Outdated appliances no longer work how they used to and can really slow down your daily activities. A simple update to your home such as new cabinets can increase storage space and create a more efficient use of any room in your home. A kitchen makeover is a tremendous way to add long term value to your home. Consider it an investment! Q. KITCHEN REMODELING WHERE TO START? Where to start you ask? Well when considering kitchen remodeling we cannot stress enough the importance of hiring a licensed professional. Hiring a licensed contractor will ensure the work is being done according to your city specific building codes. Regardless of the type of kitchen remodel you are considering to undertake it is best to consult with a Los Angeles Kitchen Remodeling expert. Once you found some potential candidates that are licensed, bonded, and insured the next step is doing your research. Make sure they are reputable and able to meet your standards and needs. Review their portfolio and feedback from previous customers to find the best kitchen contractor to suit your needs. Greenworks Construction has won multiple customer service awards including Angies list 2011-Present And Best Of Houzz 2014-Present. Call today for a free estimate and ask for local references.